On that note, I have had one recurring thought the past week. It is this: More than the perfect doctor, the most nurturing midwife, the swankiest nursery, the most efficient ultra-sound technology, the best birthing options, the trendiest maternity clothes, this pregnancy requires my happiness. You heard me, pure joy is going to grow this baby. 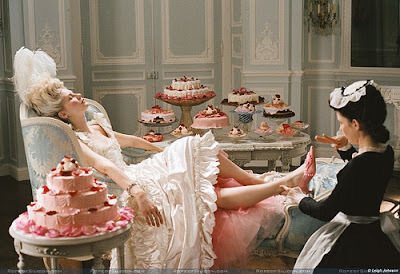 So it was that I deemed this incubation period as my Marie Antoinette Phase. You know what that means, shoes, cakes, lazy afternoons on quilted couches, music, servants (Lucy and Chup), extended cable, color, dresses, culture and giddy-ness. Even if it so happens that I start to vomit everyday, at least I am puking up designer cakes! After I was done at the Happy Clinic! Chup met me for dinner at the California Pizza Kitchen. Lucy and Andrew came too. We had a table on the veranda and the chefs made Lucy the Pear and Gorgonzola pizza even though they were inhumane enough to take it off the menu in the first place. Wheat crust too. Heaven help me, or as Marie would say, incroyable! Post-dinner I made the group help me locate the new Forever 21 Orem just acquired. We looked and looked and finally I saw this store that was called XXI Forever. Judging from the metallic bags on display, I declared that we had found the place! But really, note to that store: Most of your clientèle don't know their roman numerals, maybe not the best choice for girls who are looking for a place to buy a sequined halter to go clubbing. Just an FYI F21! When Chup and I finally arrived home later that evening I was having a Happy Time Out. I just needed a break so that I could complain about how tired (how tired!) I was feeling. As we passed the red mailbox, Chup looked in to see that Topher had made a compilation cd for me entitled "Your Baby Needs This" except that with Topher he always writes in lower-caps, so it really read "your baby needs this." (Topher has first hand knowledge of what babies need, because right as I type, his wife Lisa is growing my baby's cousin, otherwise known as their fifth baby!) One of the songs on the cd is by Wilco. Listen, more than the most potent prenatal vitamins, every baby needs Wilco. Or as Marie would say, naturellement! We are also planning a last-of-the-you-and-me-only-show trip to London. Ok, so it is not quite Versailles, but nothing makes Mama more happy than Hob Nobs in Hyde park . . . even if I have to gag them down. Or as Marie would say vomissez. P.S. I want to say Une Grande Merci to everyone for your sweet e-mails and lovely comments! It makes me cry before I go to bed at night. And a special shout out to my comrades who are also in their first trimester, Geo, May and Bunny! Are your chests also growing at alarming rates?? ?